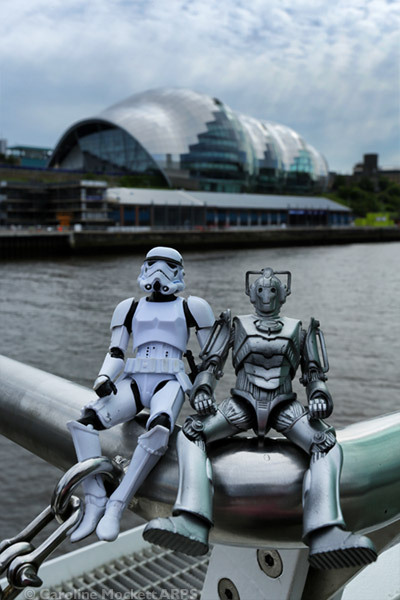 The guys had a long walk along the Tyne and ended up near the Milllennium Bridge overlooking the Sage in Gateshead – commonly known as “the shiny slug”. They were pleased to have a rest for a few minutes overlooking the architecture. I thought I only brought three Kens with me for my walk today, but it seems I was wrong! We found this silly No Bathing sign by the lock gate at Sandford Mill. I didn’t think anyone would be daft enough to want to take a dip, but when I asked, it seems I was wrong. Anyway, the crazy Kens helped me out with this week’s theme, Multiple Exposure. If they went swimming, they’d certainly get exposure at this time of year! The Uglies enjoyed a stroll in the pretty village of Lacock with us. They were very excited to find this little humpty-back bridge by a stream as they wanted to be in this week’s Challenge 52 picture. So here you have Jeero, Ninja Batty Shogun and Pointy Max sporting their winter woollies. Perfect for the theme of bridges.